Hang in there, Mark Watney. The world is cheering for you to find a way home. Everyone’s watching every move you make, every arduous step you take, every wry observation. This particular castaway is an astronaut stranded alone on Mars, forced to survive with extremely limited resources, in a place completely inhospitable to human life. But this futuristic MacGyver – Andy Weir’s protagonist from “The Martian” – is determined to contact NASA and get back to his family. Here on Earth, starting Sept. 15, teams will compete in a Hacking Mars design challenge to come up with solutions to help Watney, while fans can track his progress on the Red Planet with a new interactive map from Bing. And teachers and students across the country will be able to download space-related curriculum through Bing in the Classroom . These are just some of the ways that Microsoft has partnered with 20th Century Fox to tap into the release of the film adaptation of “The Martian” as an opportunity for fans of all ages to learn more about Mars and space. It’s also a way to empower those around the world to embrace and imagine what life on Mars could look like. The Hacking Mars Design Challenge invites teams to research and submit a three-to-five minute video about a product, service, app or game that would help Watney: stay alive (grow food, filter air, produce water), pass time (keeping hope alive, dealing with extreme isolation and constant stress) and get home (focusing on communication issues). They can tackle one topic or take on all three. The deadline for entries is Oct. 13. The challenge website provides steps, instructions, a toolkit and other resources for the challenge. Participants will be able to tap into Microsoft experts via Skype and watch videos related to the film. Another big bonus: custom-made videos from Fox containing interviews with the novel’s author, Andy Weir, talking about the challenges Watney faces on Mars as they relate to those three topics. Out of three groups of finalists, one team will emerge victorious and travel to Microsoft to experience HoloLens and pocket a $25,000 grand prize for #HackMars – in addition to a suite of Microsoft products like Surface, Xbox One and Microsoft Band. Though anyone in the world over the age of 18 can enter the competition, students with STEAM (science, technology, engineering, the arts and math) backgrounds and interests are strongly encouraged to try it out, as the film tie-in presents such a strong educational opportunity. Leading up to the Oct. 2 broad release of “The Martian” movie, fans can also follow along via an interactive experience that takes you along the same path Watney took from Ares 3 to Ares 4 (the landing sites of the NASA Mars landings in “The Martian”). The experience uses real imagery of the Red Planet, Bing Maps API and the Azure platform to track Watney’s journey across Mars. Across the map, fans will find points of interest that include videos, search results and other resources that add more context for curious would-be space travelers. In addition, Watney will be sending transmissions of his progress every day from Sep. 15 until he reaches his destination in early October. Fans of the book will recognize “Bing Watney Home” as a tongue-in-cheek reference to the worldwide mantra that unites people who supported the mission and its resourceful hero as he fights to get home. While the book – especially Watney’s journal entries – is very descriptive and engaging, there are few visual illustrations. But with the Bing mapping experience, fans will be able explore his expedition at their own pace. They’ll be able to zoom in and out to view the landscape and “The Martian” content, hover over flags and markers to see a sneak peek of information such as coordinates and relevant topics. Another educational aspect of Fox and Microsoft teaming up for “The Martian” is the opportunity for classrooms to participate in discussions about space through lesson plans about science, engineering and language arts, all available to K-12 educators. The Bing home page lesson plans coincide with home page images that teachers of different grade levels can use for free. They can incorporate the plans into daily routine, or use them at various points during the school year. “The Martian” could also stir interest in STEAM classes, and that’s an area in which Microsoft has made significant investments through Microsoft YouthSpark, a global initiative to provide access to computer science education to all youth. Educators, engineers, software developers or programmers interested in helping high school students learn computer science can volunteer through TEALS (Technology Education and Literacy in Schools), a cornerstone of YouthSpark. 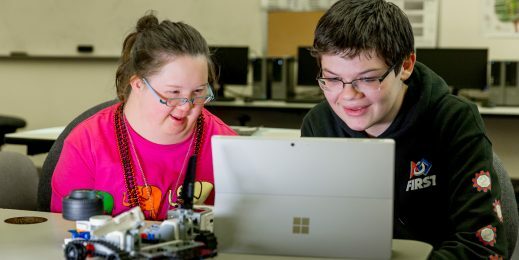 Microsoft YouthSpark also encourages coding and problem solving at an early age through the YouthSpark Summer Camps, Microsoft Imagine and its global support to the Hour of Code. Who knows, maybe amidst these budding technologists, a real Mark Watney will emerge.